War is devastating. There are so many victims who go unmentioned. Innocent people, innocent children… and yes, innocent animals. Recently, a small puppy stepped on a landmine left by ISIS. The tiny dog survived, but was badly injured. 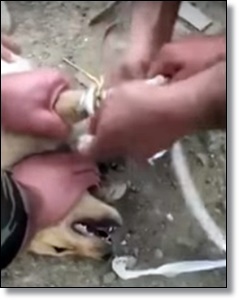 In the video below, you can see Kurdish soldiers rush to save the puppy’s leg with first aid. The puppy’s cries are heartbreaking. Unfortunately, there’s no further information about the dog, but we are glad the pup is alive and so thankful to these brave soldiers.